DETROIT – U.S. Bankruptcy Judge Steven W. Rhodes confirmed Detroit’s “Eighth Amended Plan of Adjustment” Nov. 7, as Michigan Gov. Rick Snyder, Detroit “Mayor” Mike Duggan, and Emergency Manager Kevyn Orr, along with the vast majority of the mainstream media, celebrated unabashedly. See his order at Oral_Opinion_on_Detroit_Plan_Confirmation. Michigan Gov. 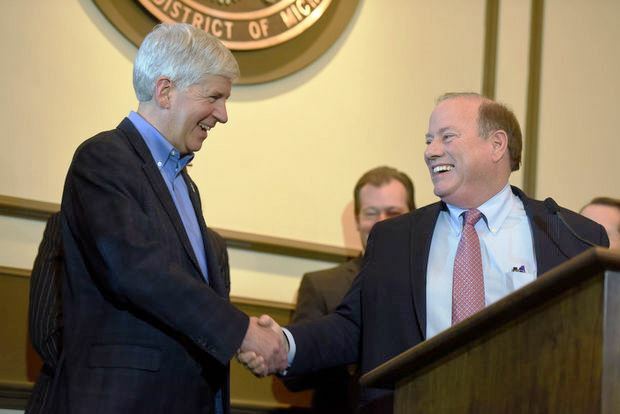 Rick Snyder and Detroit Mayor Mike Duggan celebrate bankruptcy plan confirmation Nov. 7, 2014. 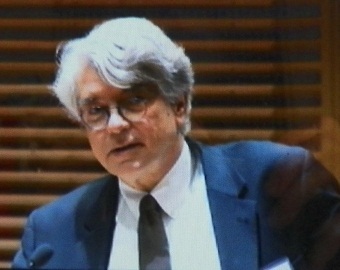 James Cole compared bankruptcy plan to 1921 Greenwood massacre. 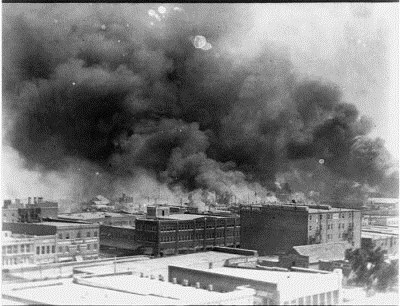 He compared the plan to the horrific, racist burning and looting of Greenwood in 1921, a prosperous community in Tulsa, Oklahoma known as “The Black Wall Street.” Three hundred Black residents of Greenwood were murdered during the assault. A recent report from the independent Municipal Market Advisors, cited in The Bond Buyer, says the plan is likely built on sand. MMA cited Detroit’s deliberately devastated public school system as a major detriment to new residency and investment in the city. This is not Detroit in 1967; it is the Black Wall Street in the Greenwood neighborhood of Tulsa, Oklahoma in 1921, consumed by flames set by KKK members and other whites. Three hundred Black residents died, thousands of homes and business were forever destroyed. 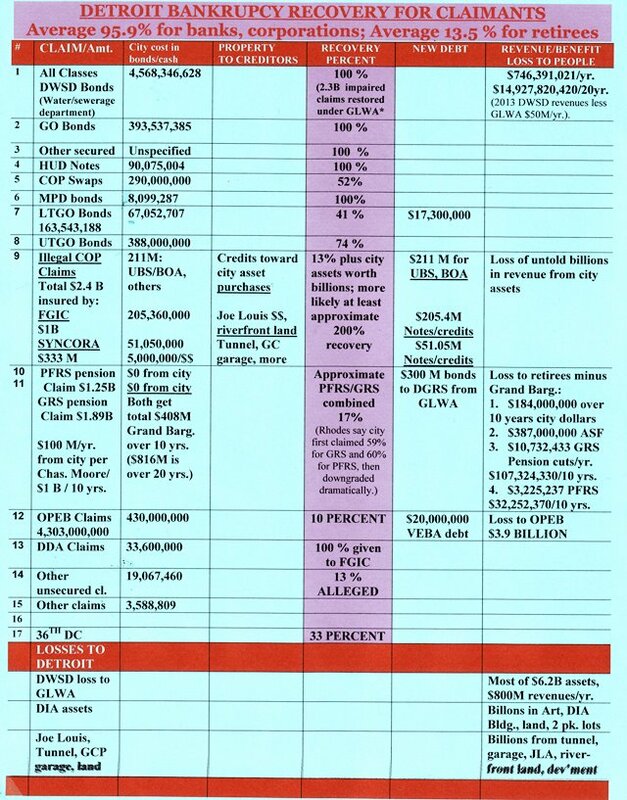 VOD looked at the ACTUAL recovery amounts for all Detroit creditors, not the phony reports from the mainstream media that focus only on “unsecured” creditors. They claim Detroit shed $7 billion out of $18 billion in debt under the Plan of Adjustment, with city retirees faring better than corporate creditors. VOD’s analysis shows that, including vast amounts of property and revenue ceded to the corporations, corporate creditors recovered 95.9 percent of their city debt. Retirees recover only 13.5 percent, combining a 17 percent pension/annuity recovery rate with a 10 percent OPEB (health benefits) rate. Figures in the chart below include secured debt. They are from various sources including Rhodes’ opinion, retirement system annual statements, and the Plan of Adjustment. Some figures are approximate, such as the value of city assets handed over to corporations. Gov. Snyder lauded the settlement, will may bring about the end of Detroit. Protester carries painting of Detroit “Dictator” Kevyn Orr. Meanwhile, Orr stuck his foot in his mouth, confirming opponents’ observations about the origins of the bankruptcy. Perhaps he was rushing to get out of Dodge back to Washington, D.C.
“What happened here in Detroit was a combination of leadership from the governor’s office — people forget that this process began in 2010 and 2011 and its culminating now, leadership from the legislature, tolerance and leadership from city officials, and the different set of rules and laws that applied in this case, as well as from the foundations and the DIA founders who brought in a significant sum of money to address those concerns,” he said at the press conference announcing the confirmation. Thus, he said, the Detroit case does not set a precedent for other cities. Jones Day partner Bruce Bennett roundly contradicted him in a Bond Buyer interview. By the “different set of rules and laws that applied in this case,” Orr referred to Michigan Public Act 436, which put him in office as EM with virtually unlimited powers. The act has disenfranchised not only Detroiters, but over half the African-American population of Michigan. Rhodes barred objectors from challenging the constitutionality of PA 436 in higher courts. U.S. Attorney General Eric Holder and President Barack Obama ignored requests to investigate its predecessor act PA 4 as a violation of the Voting Rights Act. No other city currently pursuing Chapter 9 is thus afflicted. Events in 2010 and 2011 referred to by Orr included the publication of a Jones Day white paper entitled, “Pensions and Chapter 9: Can Municipalities Use Bankruptcy to Solve Their Pension Woes?” which laid out the plan of action that has governed Detroit’s bankruptcy proceedings. The parties including various law firms also conspired to ensure that the Emergency Manager act would remain on the books despite a state-wide popular repeal of PA 4. Law firms originally hired by the state in 2011, including Jones Day and Miller Buckfire, were later brought on board by the city, under terms of the treacherous 2012 “Consent Agreement” with the state, to carry out the plan conceived earlier. On Oct. 10, 2012, Judge Rhodes chaired a one-sided forum on Chapter 9 and Emergency Managers which consisted of key players in the Detroit bankruptcy. They included a co-author of the original EM law, PA 4, two EM trainers, and Charles Moore of Conway McKenzie, a major non-expert witness at the bankruptcy trial. Rhodes denied requests to recuse himself for this blatant conflict of interest. Judge Rhodes at Oct. 10, 2012 EM/CH9 forum with (l to r) Frederick Headen of State Treasury, who has helped take over dozens of cities, Edward Plawecki, EM trainers Douglas Bernstein and Judy O’Neill, also a co-author of PA4, predecessor to PA 436, and Charles Moore of Conway McKenzie, chief witness for Jones Day at bankruptcy proceedings. Rhodes is at the lowest end of the pecking order of federal judges. Above him are the U.S. District Court, the Federal Court of Appeals, and the U.S. Supreme Court. With the help of the mainstream media and betrayals by retirement system and union officials of their memberships, Rhodes kept constitutional appeals by city workers and residents out of those courts during the pendency of the bankruptcy. His only previous experience handling a Chapter 9 bankruptcy was that of the tiny Addison Community Hospital Authority in Lenawee County, Michigan in 1992. 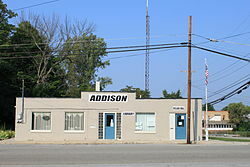 Addison has a population of only 605 according to the 2010 U.S. Census. These factors help explain the stunning simple-mindedness, subtle racism, and outright errors exhibited in his oral ruling as committed to writing. He left out at least one key issue contained in “11 U.S. CODE § 109 – WHO MAY BE A DEBTOR,” a basic requirement that the municipality be insolvent. The full Demos Report is at Demos Detroit bankruptcy report highlighted. So it was really $132.6 million? That was the sum total of Detroit’s alleged insolvency? Former Councilwoman JoAnn Watson speaks as groups take lawsuit for a referendum on PA 4 to the Court of Appeals. At a hearing before Rhodes Oct. 15, former Detroit City Councilwoman JoAnn Watson declared, “The state has a conflict of interest because it is a debtor to the city.” She then went on to explain that Michigan owes Detroit at least $1.5 billion. She cited the State’s deliberate refusal to pay Detroit over $224 million in agreed-upon revenue-sharing, the attendant loss of $600 million in non-resident income taxes, as well as the State’s cutting of $732 million in revenue-sharing to the city over the previous 10 years, cited in a report from the Michigan Municipal League. Add to that the billions in tax abatements the City of Detroit has granted over the years to the various corporations which are feeding like pigs from the bankruptcy trough, and the billions of dollars lost in property and income taxes due to the massive and illegal foreclosure devastation of Detroit’s neighborhoods by those same banks and corporations. So to avoid bankruptcy, all the state really had to do was cough up $198 million of what it and the corporations OWED the 82 percent Black population of Detroit. “The cornerstone of the plan is the grand bargain,” Rhodes says in his ruling, citing traitorous settlements by the Official Committee of Retirees, the General Retirement System, the Police and Fire Retirement System, AFSCME Council 25, the UAW, and various retirees’ associations. 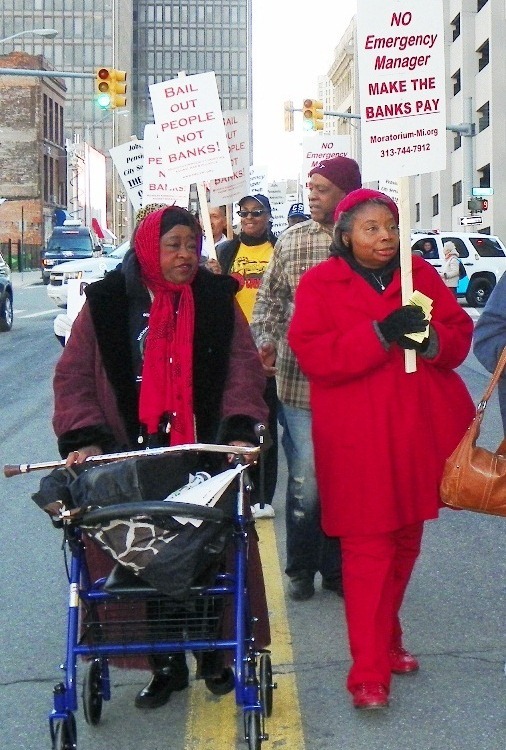 City retirees protest April 1, 2014. Broken down, the pension funds will get contributions from the state of $195 million over 20 years, 13 percent of what Michigan owes Detroit. The DIA will contribute $100 million over 20 years, while the city loses title to billions pf dollars worth of art, which will be transferred to a bank trust, as well as the DIA building, its land, and revenues from two parking lots there. Private foundations will contribute $366 million over 20 years, no doubt using them as tax write-offs if they are not already tax-exempt non-profits. Charles Moore, another chief “non-expert” pro-bankruptcy witness who is an accountant for Conway McKenzie, estimated the city averaged around $100 million a year in contributions to the two retirement systems, which will be eliminated until at least 2023. So that’s $1 billion. Since the Grand Bargain covers 20 years, half of it is $408 million over 10 years. That’s a LOSS in city contributions to the retirement systems of $592,000,000, over a half-billion dollars over the next 10 years. But that’s not the end of the devastation wrought on city workers and retirees. The mainstream media is reporting that Wall Street bondholders are angry because they are allegedly being treated worse than retirees in the bankruptcy plan. Rhodes says, “The settlement will net approximately $190 million for the GRS, which is about 49% of the City’s calculation of its claim here.” Earlier, he said the GRS allowed claim totaled $1.879 BILLION. Didn’t he learn simple math in school? That amounts to 10 PERCENT of the GRS claim. Protest recalls Memphis sanitation workers’ strike of 1968, which Dr. Martin Luther King Jr. supported, and was gunned down in the midst of it. 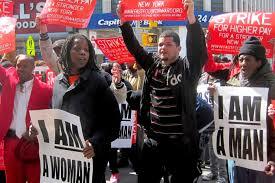 What about discrimination against the city’s majority-Black workers, retirees and residents? 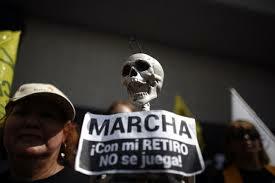 The media says General Retirement System retirees will lose “only” 4.5 percent of their monthly pension checks. In fact, losses to retirees amount to far more. The total average loss of COLA to each GRS retiree amounts to $33,500. The hotly debated savaging of retirees’ annuity savings plans will result in an average loss of $27,000 plus 6.75 percent annual interest, to retirees who generally get only $19,000 a year in pension pay-outs. Rhodes says later the city expects to recoup $387 million from the ASF cuts alone. He says pension and ASF cuts will be capped at “only” 20 percent. The late world renowned Detroit activist General Baker campaigned against VEBA’s in the auto plants. Police and Fire Retirees, manipulated for use against non-uniformed workers, were rewarded with NO loss in their pension checks, but still a 45 percent loss in COLA. This does not factor in cuts in health care for workers and retirees under the age of 65, expected to save the city $3.9 billion. 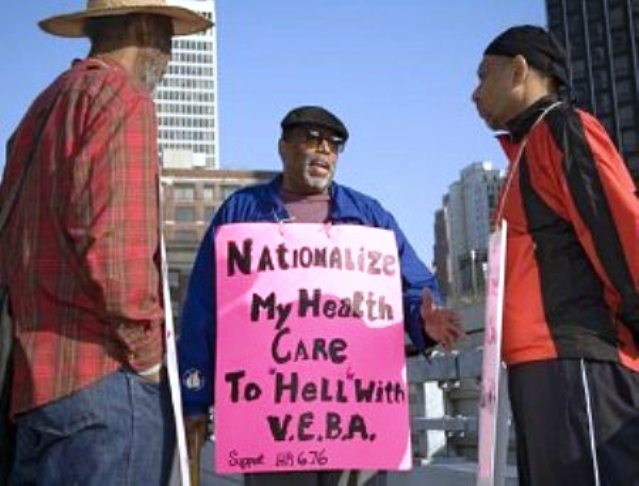 Current retiree health plans will be replaced by “Voluntary Employee Benefit Associations” (VEBA’s), bank trusts with state-appointed boards. Language in the plan says the VEBA’s do not guarantee that ANY health care will be provided. Rhodes says current city workers will have their pension plans frozen and replaced with “new hybrid pension plans” whose provisions are “less generous” than the current plans. In 2004, the City of Detroit had 13,486 employees. Ten years later, according to its Human Resources Department, it has only a little over 9,000 workers. 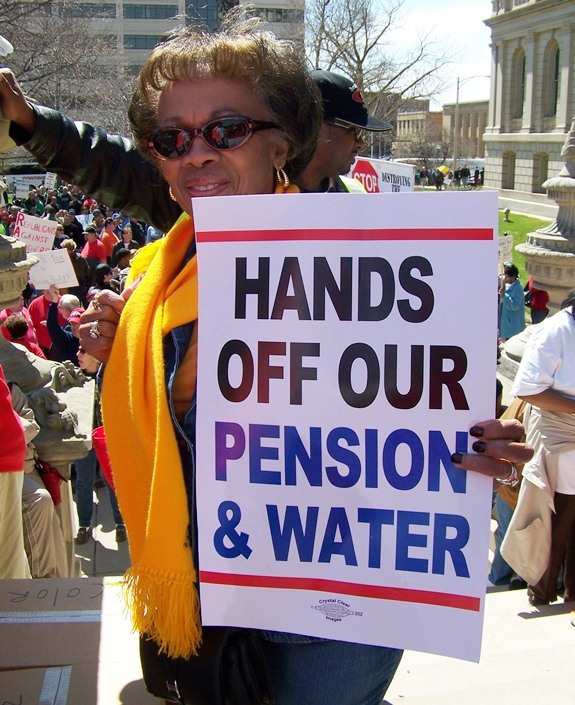 Add to that the loss of thousands of health, workforce development, human services, sanitation, recreation and public lighting department workers to privatization, along with DWSD workers to the regional Great Lakes Water Authority. Clearly the retirement systems’ income from these members will diminish accordingly over the years. Whether the systems will survive at all is open to question. ALL Detroit retirees may eventually find themselves depending solely on their Social Security checks. Additionally, what becomes of thousands of decent jobs with union wages and benefits for the city’s increasingly unemployed population, especially the youth? “PFRS and GRS will each have an investment committee that will make recommendations to, and in certain situations approve the actions of, their boards of trustees,” Rhodes says. These “investment committees,” largely appointed by the state, will thus decide which state business cronies get billions. City retiree Ezza Brandon participates in protest outside Michigan AFSCME HQ after her union agreed not to appeal bankruptcy plan to Sixth Circuit Court. Regarding appeals to the Sixth Circuit Court by unions and retiree organizations, Rhodes throws out a ball park figure, not based on any cited calculations, that they will have a 25 percent chance of success. Not to worry, though. 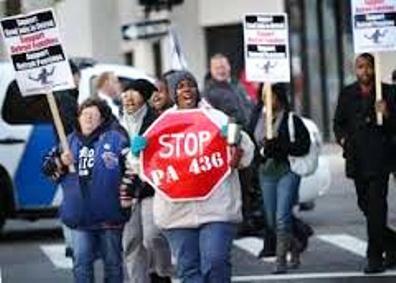 Those groups already told the Sixth Circuit the appeals would be withdrawn if the Grand Bargain and the Plan of Adjustment go through, and that they will not oppose PA 436 or bring up the State Constitution’s protection of public pensions under Art. 9 Sec. 24. Ironically, PA 436 requires EM’s to adhere to the provisions of Art. 9, Sec. 24, which Rhodes of course does not note in his opinion. In January, 2013, EM Kevyn Orr filed suit against the parties involved in the infamous $1.5 billion Pension Obligation Certificate (POC), otherwise known as COPS (Certificates of Participation) deals of 2005-o6. He called the deals “void ab initio, illegal and unenforceable.” He cited the fact that paper corporations were created to handle the loans, and that they were a way of circumventing the city’s debt ceiling by not issuing actual bonds, among other issues. 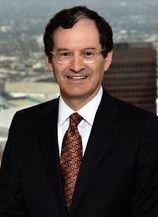 He failed to cite the fact that city voters were deprived of their right to vote on the debt by hiding it as “certificates” instead of bonds, and the unethical involvement of then Detroit CFO Sean Werdlow, who took a top position with SBS, one of the lenders, in Nov. 2005, and is now its COO. Currently, the city owes $2.8 billion on the COPS claims as they are commonly known, due to defaults, interest and other factors. Protester against global bank UBS, which has committed criminal fraud world-wide. 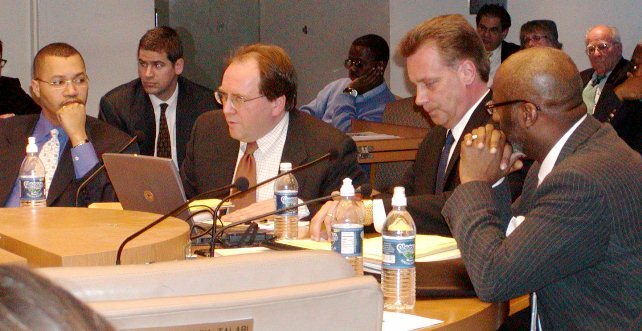 The original deal was brokered by Wall Street, whose representatives from Standard and Poor’s and Fitch Ratings came to the City Council table Jan. 31, 2005, threatening to lower the city’s bond ratings if the loan was not approved, which they did anyway at the end of 2005. The lenders were the global bank UBS AG and SBS Financial, backed by the Bank of America. The loan was insured by Financial Guaranty Insurance Corporation (FGIC), and Syncora. 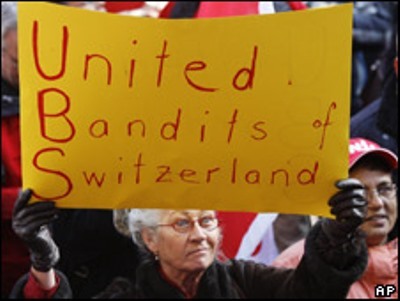 UBS AG and BOA have been criminally and civilly charged in hundreds of lawsuits around the world for manipulating the LIBOR interest rate to their benefit, and otherwise gouging profits illegally from mortgage loans and other sources. UBS AG paid a $2.5 billion settlement to the U.S. Department of Justice in one lawsuit. Rhodes claims it is only 13 percent of the original claim. Rhodes LIES. 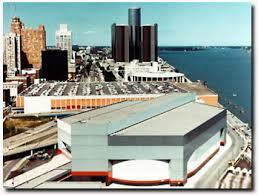 Joe Louis Arena on priceless Detroit waterfront. Settlements with UBS, BOA, FGIC and Syncora totaled $472.4 million in new debt, including the $33 million Downtown Development Authority claim. But they also included the handover of city revenues from Joe Louis Arena and profits from later redevelopment of surrounding, priceless riverfront land, all city revenues from the Detroit-Windsor Tunnel and the Grand Circus Park parking garage, plus other unspecified claims on city assets. There has been no total computation of the worth of these assets, but they most certainly run into billions of dollars, far more than the outstanding debt. ‘GREAT INVESTMENTS’ IN DETROIT BY FGIC, SYNCORA? Lawyers and financial advisors celebrate FGIC agreement. 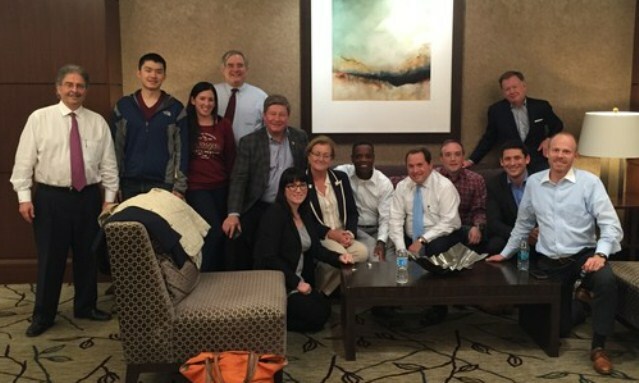 Hidden amongst all the whites is EM Kevyn Orr, crouching down in center. He wasn’t even named in Crain’s caption. State and city leaders have touted the deals as great investments in Detroit. 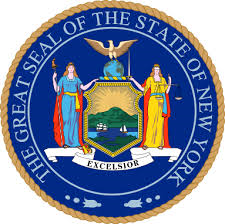 However, FGIC is currently under state oversight in New York City. “FGIC emerged from rehabilitation on August 19, 2013, and is responsible for administering its outstanding insurance policies in accordance with the terms of the First Amended Plan of Rehabilitation for FGIC, dated June 4, 2013,” according to an FGIC release. FGIC is under state oversight due to poor financial condition in past. 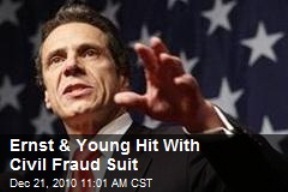 That is why it must get New York state approval for the deal. Weiss Ratings said it was “on the brink of failure” in 2012. 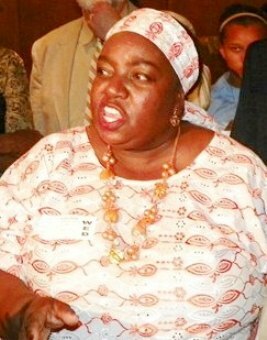 “As of March 31, 2012, FGIC reported negative capital of $3.7 billion and losses year to date of $146.7 million, after $1.2 billion losses in 2011. It had been rated “Very Weak” by Weiss Ratings since January 2010,” the agency reported. FGIC filed for Chapter 11 bankruptcy in 2010, citing $391.5 million in debt as compared to $11 million in assets. Syncora has seen a downturn in its financial position as well. It is currently being monitored by the New York State Department of Financial Services. Puerto Rican workers have been demonstrating all year against proposed cutbacks to their pensions and jobs, to solve the island’s debt crisis, made in the USA. Their unions have threatened a general strike. Utility unions are calling on customers NOT to pay their bills! Both FGIC and Syncora are on the hook for billions of dollars in insurance on various forms of debt in Puerto Rico, which is facing the possibility of default, forcing insurers to accumulate larger financial holdings. The Bond Buyer reported, “Total net par outstanding exposure to Puerto Rico bonds by Assured, MBIA’s National Public Finance Guarantee, Ambac Assurance Corp., Syncora Guarantee and Financial Guarantee Insurance Corp was $15.7 billion by June 30, according to an analysis by the Bond Buyer. The financial guarantors have wrapped a wide spectrum of Puerto Rico debt, from commonwealth general obligations to below investment-grade aqueduct and sewer bonds. Rhodes’ ruling now means muni bonds can be backed by city assets in Chapter 9 bankruptcy. Does Detroit REALLY want these incompetent, greedy companies investing here? 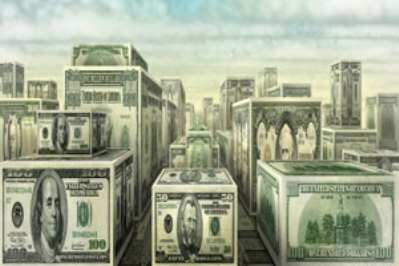 Ironically, other business magazines report that the market for municipal bonds has improved since Detroit’s settlement with FGIC and Syncora. That is clearly because insurers figure that what they can’t get from tax-backed bonds they can steal from the assets of the cities they insure. No wonder Rhodes rushed into these deals. 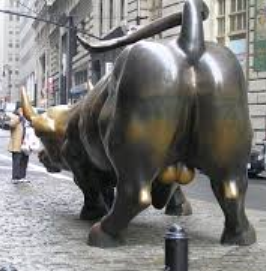 After all, the stock market demanded it. Rhodes completely contradicts himself in this section. Detroit Institute of Arts saved for private elite. “No provision of law allows the creditors to access the DIA art to satisfy their claims,whether in bankruptcy or outside of bankruptcy,” he says, referring to attempts by some creditors to monetize DIA holdings. Rhodes then lauds in glowing terms the contributions of the DIA. 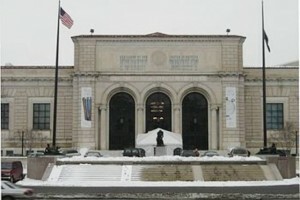 “The evidence unequivocally establishes that the DIA stands at the center of the City as an invaluable beacon of culture, education for both children and adults, personal journey, creative outlet, family experience, worldwide visitor attraction, civic pride and energy, neighborhood and community cohesion, regional cooperation, social service, and economic development,” he raves. Thus, Rhodes says, it is all right to monetize and give away an asset like the $6 billion Detroit Water and Sewerage Department, which provides the most essential element of life aside from air to its customers—water. This comes as no surprise, since he earlier ruled that there is no obligation under the State constitution to provide sanitary water at affordable prices to Michigan residents. 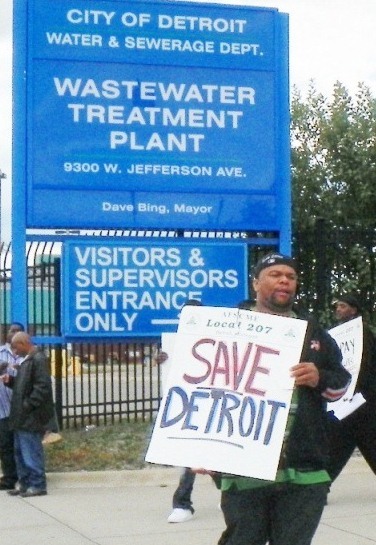 He was responding to a lawsuit filed on behalf of tens of thousands of Detroiters, including seniors, children and disabled people, objecting to Detroit’s massive shut-off of water to their homes. 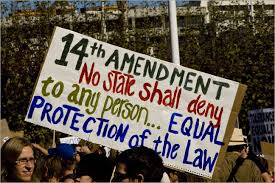 The 14th Amendment should protect the people of Detroit against unequal treatment; Rhodes thinks its up to his conscience, a sure sign of racist beliefs. He proceeds to claim that the plan FAIRLY discriminates IN FAVOR OF PENSIONERS. Of course, as can be seen from the chart above, that is not the case. Corporations get a 95.9 percent recovery, while pensioners get 13.5 percent. 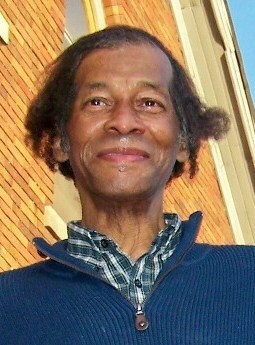 As far as unfair discrimination being a matter of conscience, Rhodes, although he is a Federal judge, has apparently forgotten numerous Federal LAWS including among many, the Civil Rights Act of 1964, the Voting Rights Act, the 14th Amendment to the United States Constitution, the Equal Employment Opportunity Act, Age Discrimination Acts, Americans with Disabilities Act, Equal Pay Act, Family and Medical Leave Act, and the Homeless Bill of Rights. These laws were not passed to protect the corporations and banks of this country, as Rhodes seems to aver. Many have been cited in lawsuits challenging the constitutionality of PA 436. Most glaring, of course, are the Detroit bankruptcy filing’s violations of the Civil and Voting Rights acts, and the 14th Amendment. This bankruptcy filing was brought down under a dictatorship, without the consent of Detroiters or their elected officials. It GROSSLY violates the 14th Amendment. 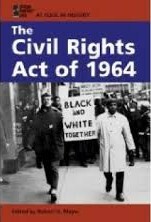 “The 14th Amendment to the Constitution ratified on July 9, 1868, granted citizenship to ‘all persons born or naturalized in the United States,’ which included former slaves recently freed. In addition, it forbids states from denying any person “life, liberty or property, without due process of law” or to “deny to any person within its jurisdiction the equal protection of the laws.” By directly mentioning the role of the states, the 14th Amendment greatly expanded the protection of civil rights to all Americans and is cited in more litigation than any other amendment,” says a Library of Congress web guide. The City of Detroit is the largest and poorest Black majority city in the U.S. It was deliberately targeted by Jones Day, which represents most of the major banks and corporations in the U.S., and by Michigan Gov. Rick Snyder and the think tanks behind him, which formulated the emergency manager laws. Those laws have targeted ONLY majority Black cities in Michigan. 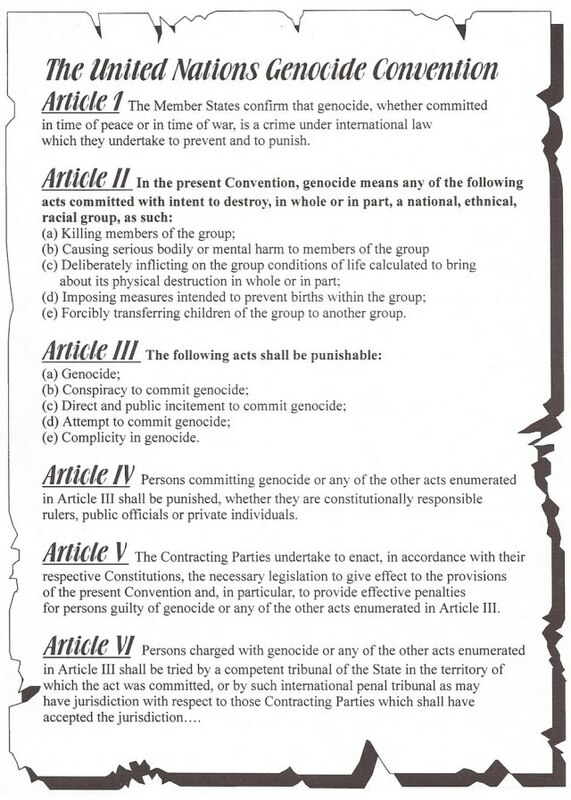 Other parts of the UN definition of genocide are being carried out against the majority population of Detroit by other arms of the state. They include the disproportionate kidnapping of Black and poor children by Child Protective Services, the unbridled police murders and incarcerations of Blacks from Detroit and across Michigan and the U.S., and finally Detroit’s skyrocketing infant mortality rate, a direct effect of poverty and the destruction of available public health care through privatization of the Detroit Health Department, and the sale of the Detroit Medical Center to Wall Street hedge funds for profit. 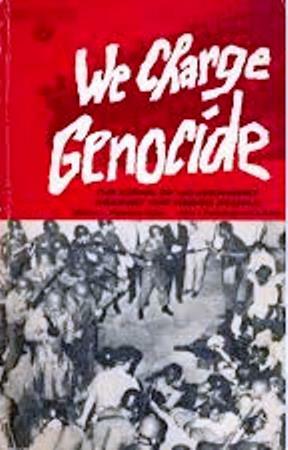 What does a people do when faced with genocide? Organize an army, construct barricades to stop the water shut-off trucks, take over essential city services, take back DWSD and Belle Isle by any means necessary. Preserve the future for the children and grandchildren of the City of Detroit. THIS IS A GENUINE AND IMMEDIATE MATTER OF LIFE OR DEATH. 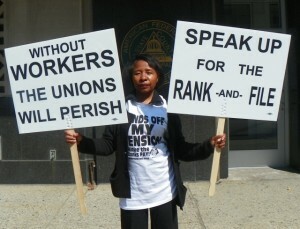 The video above is of a press conference held by the Detroit Retired and Active Employees Association. They can be contacted c/o Bill Davis at 313-622-6430. 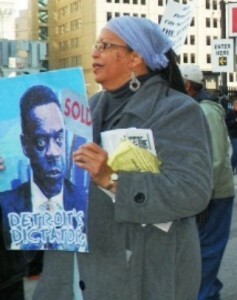 Other organizations active in the ongoing fight against the Detroit bankruptcy plan of genocide are Detroiters Resisting Emergency Management, at http://www.d-rem.org/, the Stop of Theft of Our Pensions Committee at 313-680-5508, and many more. There are no related VOD stories posted here because they are too numerous. Just put “bankruptcy” or “emergency manager” or “consent agreement” in the search engine to bring up complete VOD coverage of the Detroit takeover over the past several years.